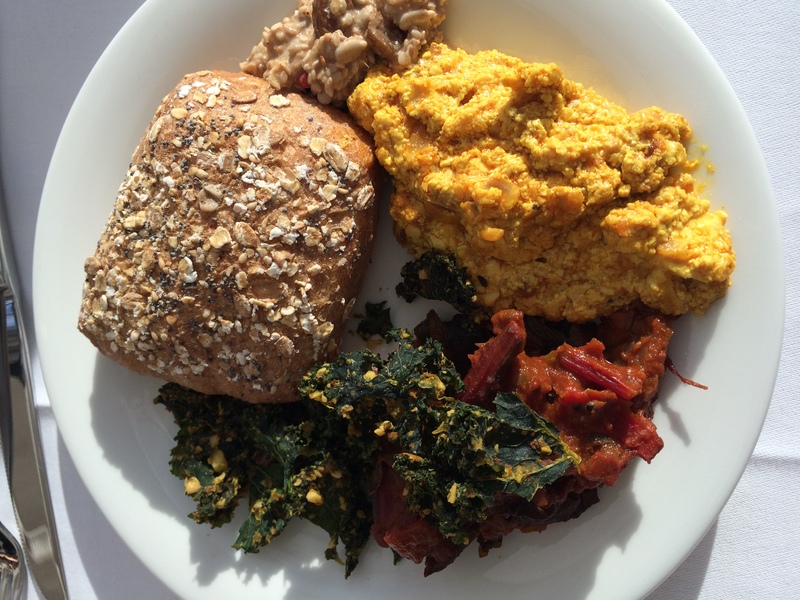 Today, I had the pleasure to try out a Cocoa YIN YOGA session followed by a vegan and organic Sunday brunch buffet and an inspirational exchange with other bloggers at Essentis – Biohotel in Berlin.. I knew the yoga teacher Khorshid already from the yoga classes at my workplace, but I have never taken a YIN YOGA class with her. 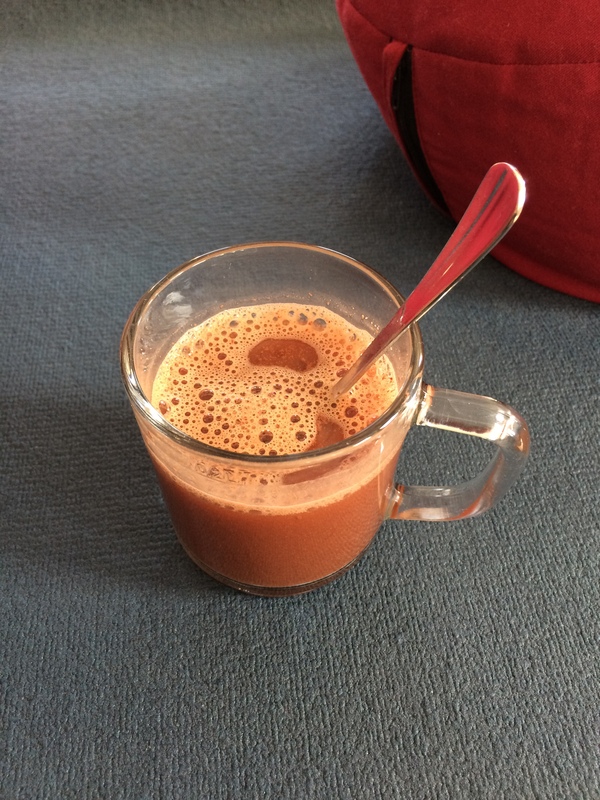 As you know, I have practiced Yin Yoga at the yoga retreat in St. Peter Ording and in NYC last year already, but today in Khorshid’s class, I’ve tried something new: Yin Yoga combined with hot cocoa and chilli. Hot cocoa and chili in a yin yoga class? Yes, I know. That sounds like trying to fall asleep while drinking an espresso. However, I can assure you: it’s not at all counterproductive or unrelated. The hot cocoa “ritual” is actually part of a meditation and deepens and intensifies the Yin Yoga practice by creating heat in the body and helps us to release our tension and to open our hearts.. The Yin Yoga practice has a more meditative approach and is all about LETTING GO, and for actually being able to let go, we need to OPEN UP. As I described in earlier posts before, by holding each position for 3 to 5 minutes, we allow our muscles to relax and to go deeply into our fascia or also called conjunctive/connective tissue and to increase circulation in our joints and improve our flexibility. That’s exactly where we are storing and holding on to our past experiences and deep emotions, and that’s what makes Yin Yoga so intense. Yin Yoga puts us face to face with our vulnerability, our ego, and our need for control. If you open yourself up for the practice, you might end up releasing emotions or dealing with suppressed past events or feelings which you have stored away as part of a self-defense mechanism before. Be ready for it, but don’t be worried. Yin Yoga requires you to be ready to get intimate with your SELF, your feelings, sensations, and emotions. Khorshid did a really great job in reminding us that this practice is about ourselves and what we feel. Thus, if we feel tense or simply pain when being in a pose then we need to adjust or get out of it completely. It’s NOT about what the person next to us does, but rather about what’s going on within ourselves when we are in the pose. We started the 90 minute practice by thinking of something we would like to let go of and then drank the hot cocoa (made of raw cocoa powder and chili) and really focused our mind and thoughts on this intention / what we want to “say goodbye” to. The theme of today’s Cocoa Yin Yoga was not only about letting go, but mostly about opening our hearts. One thing that really stuck in my head was Khorshid’s words about unconditional love. All of us have experienced or better to say: ARE experiencing unconditional love. You don’t think you do because of negative past experiences within your family, friendships or romantic relationships? Feeding our Souls: DONE . 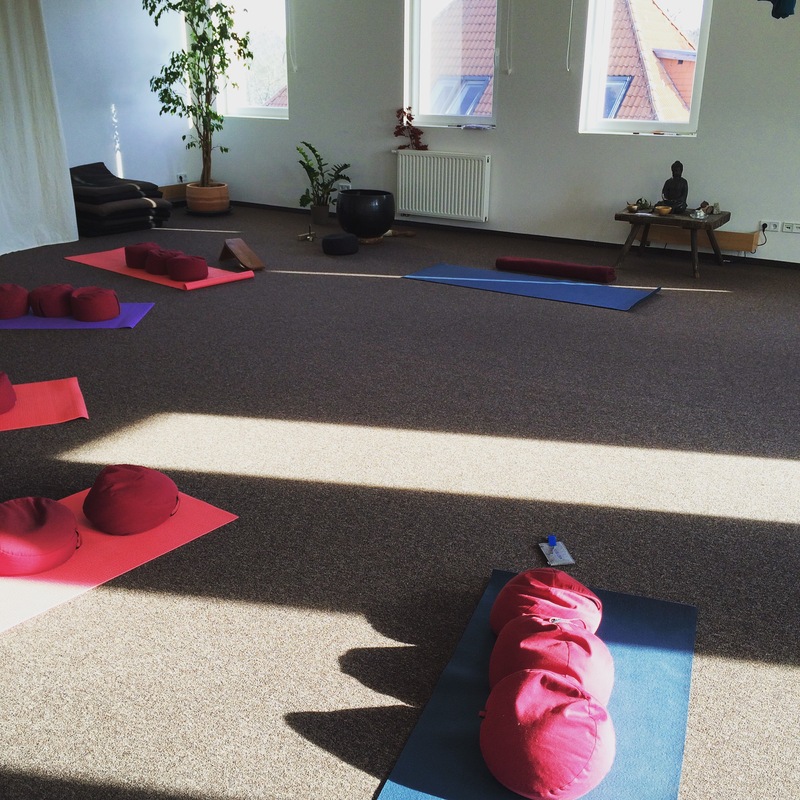 The Yin Yoga class took place in one of the rooms of the Essentis – Biohotel in Berlin. It’s a fully renovated hotel with a 1-year old program called the Essentis Community. It’s a very cozy and beautiful place. Don’t be fooled by its outside appearance! As soon as you enter the hotel, you’ll feel at ease and relaxed. The lobby and brunch room are beautifully decorated with yogi or meditative paintings and wooden furniture. The Cocoa Yin Yoga practice was followed by a vegan Sunday brunch which was great and filling. 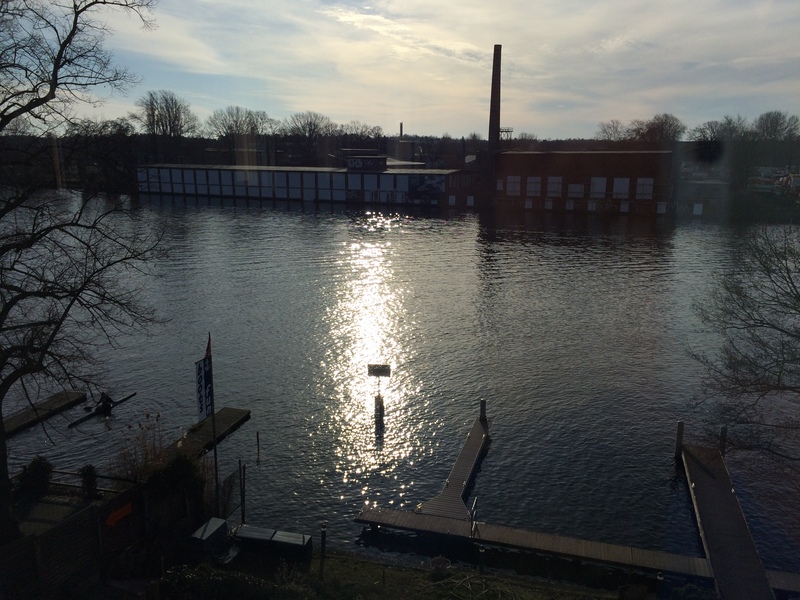 The restaurant was directly located by the Spree river (and the sun was out! ), which made the brunch even better! So, no matter what you’re looking for: just a get-away from the center of the city, a workshop about a vegan lifestyle, awareness, Shamanism, healing arts and music or about Yoga & Detox, OR you would like to celebrate a vegan wedding: this might be a good place to check out! I’ll go back for sure! 🙂 Namaste’.